The event started out low-key but picked up as the day grew. First we had one Zero, eventually two, a Spark, another LEAF, and even some non-participant EVs. We taught visitors about NRG eVgo and about how silent even the electric bikes are. Around 13:30 the first of the #Richmond2Woodbridge rally cars arrived with Richmond organizer Charles Gerena as a BMW i3, then one, then two Tesla Model S, the second, and relay prize winner, Lanny Hartmann, regaled us while taking time out from his busy work at http://pluginsites.org/. As things wore down, Charles and I grabbed a pizza and some wings and then I manned the booth until 17:00 when MOM's Organic Market helped clean up. Alas, Supervisor Principi was unable to attend though gave his regards. 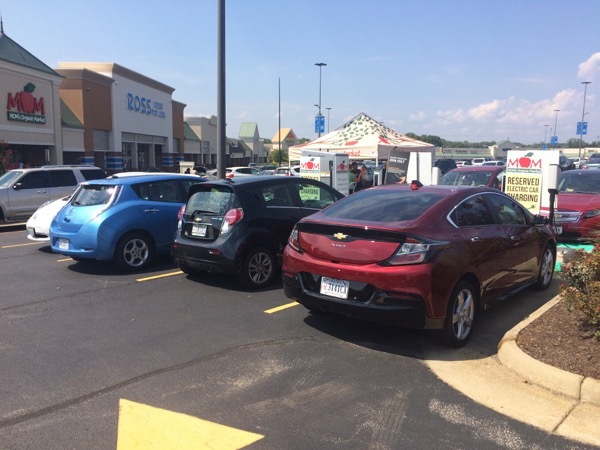 And there was no time to get a plaque made to recognize Drive Electric Week but overall my first Drive Electric Week event in Manassas was a success and I would say my last in Woodbridge was equally great and the start of something bigger! Come help us celebrate the First Anniversary of MOM's Organic Market in Woodbridge, Virginia! In the heart of EV charging, with CHAdeMO, CSS—provided by MOM's, a huge EV supporter—and a Tesla Supercharger all within walking distance (although it's best to go through the mall to get to the Tesla chargers). Enjoy the comradely all morning. Lindsay Chevrolet will be here to talk about the Volt and if you'd like to test drive one of the most awesome range extended plug-in cars available today, head on over to the dealership and you'll receive a $25 voucher for MOM's Organic Market for trying out this awesome EV. We're working with more dealerships and arranging some test drives at the event too, so stay tuned! Then, at 14:00 expect to meet our friends from Richmond coming in on the first ever Richmond to Woodbridge EV rally. We hope to make this an annual event similar to the EV rallies of old when it was Detroit Electric vs. Waverly Coup. This time, we could have Model S, Roadsters, LEAFs, Sparks, Volts, and all other matter of Modern EVs, with the list growing every day. We're hoping to have a special presentation for this event so hope you can make it. Registered attendees report 21,850 electric miles driven.